Courting males, shrill “jeee-ep.” Females, low quack. Description: Head is shiny green-black with large round white patch in front of eye. Black back and tail. 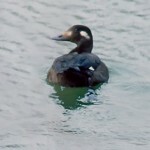 White breast, sides, and on wing. Female, grayish body with wide white collar around neck. Head is brown, with no white patch. In flight, solid white wing patch is visible. 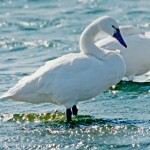 Habitat: Migrating birds can be found on lakes, reservoirs, rivers, and deeper marshes. 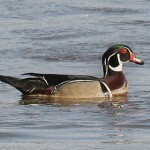 Where in Nebraska: Common to uncommon spring and fall migrant across the state. Will overwinter if open water is available. Field Notes: Common Goldeneyes are cavity nesters, and depend on hollow snags and old Pileated Woodpecker holes. 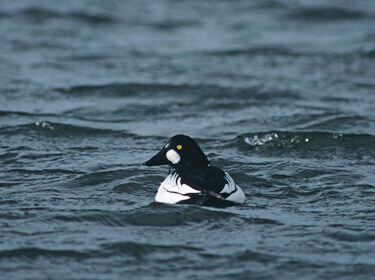 Fun Facts: Common Goldeneye females will fight over territory resulting in lost chicks not always returning to their mothers creating “creches”. Creches are multiple broods mixed together being protected by the dominating female.